I have always loved the idea of bringing the outside inside at home. I love using plants, logs as side tables and plant stands and branches as decoration. I favour natural textiles such as sheepskins, sisal and wood around the home. Not only do they add character and texture, they're inexpensive and often free - I can often be found foraging the woods for a perfect height log and have been known to stop the car on the M20 in order to scoop up a nice looking silver birch branch from the verge! Equally, I love taking the inside out and treating the garden as an extra room. 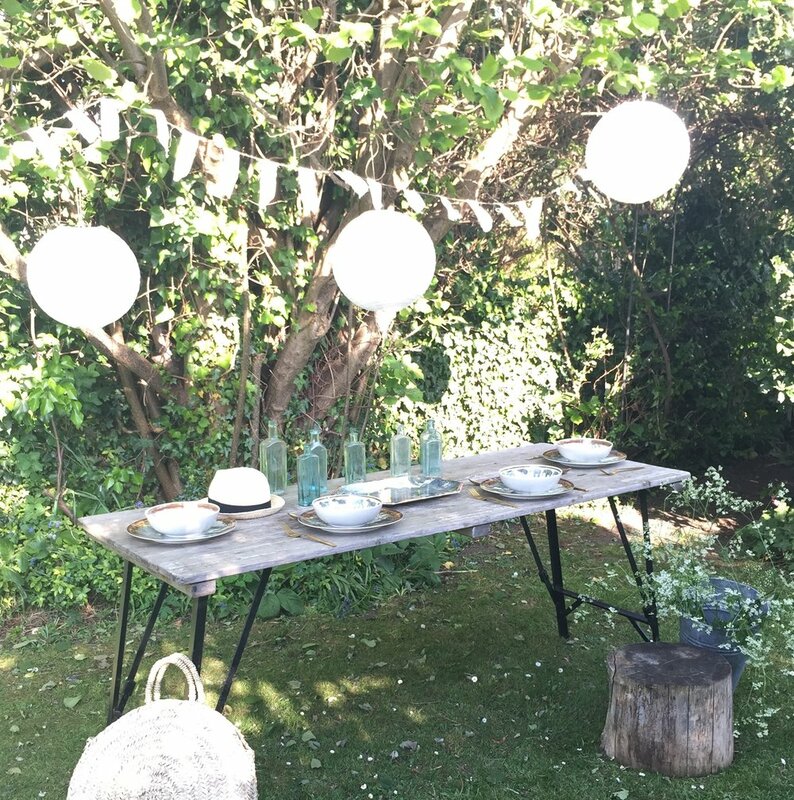 Fairy lights and festoons in the trees, outdoor sofas and outdoor dining spring to mind. I always look for multi purpose items that work equally well inside and outside. In these times of austerity, I really think that the items we purchase need to have multiple uses so that they work hard for their money. Camping in our bell tent gives me a whole new room to decorate and I don't hold back! Rugs, crates, belly baskets, vintage suitcases and crochet blankets all get piled into the van when we go camping and all get used to make the bell tent a home from home when we're away. So, when Marks and Spencers asked me to choose some of their new Outdoor Living range to play with, I jumped at the chance. I chose the Azure crackle glazed melamine plates and side plates. I love that they're solid and chunky and that they look exactly like real vintage china. I also chose the Safari range of melamine. Again, good solid quality that looks like real china. The safari theme is absolutely beautiful and picks up perfectly on the interiors trend for plants, looking equally good inside and outside. I styled both sets of melamine with the gold brushed Astoria cutlery set and gold Rhino and Elephant salt and pepper sets. Marks and Spencers have really nailed the the inside out and outside in brief with this range and the matching gold accessories definitely put the glam in glamping. I will be using all of it for dining this summer, whether it's inside or outside. This is a sponsored blog post. However, I only ever post about things I genuinely like and would have in my home.